Hey, folks. Remember a few weeks ago I talked about making Susan Fosnot's Maggie Bessie pattern? 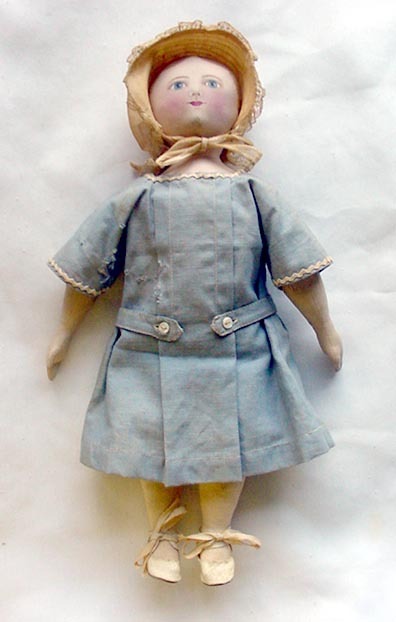 Well, the picture above shows what is thought to be an original Maggie Bessie doll in museum quality condition. Oh, my, it's beautiful! If you're a dollmaker should click the above link and see this beauty. The seller has done an outstanding job taking pictures and you'll see lots of construction details there. The clothing is so beautiful. The face painting is amazing. If you're a doll collector, well, this is a beautiful doll.